Photo courtesy of Rough Trade Records. 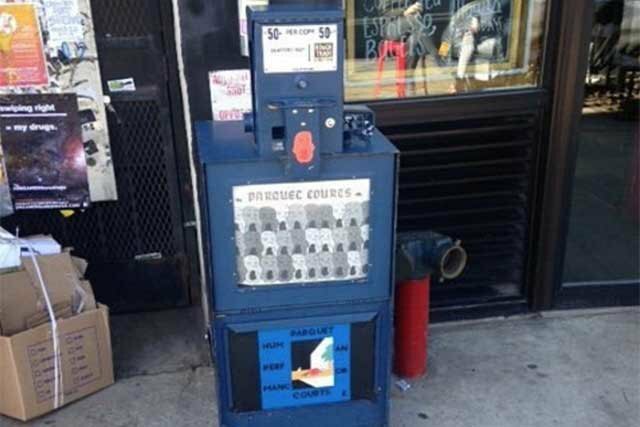 Local indie rockers Parquet Courts delighted their Bushwick fans this week by teasing their upcoming album with a merchandise vending machine, which dispenses art promoting the album, outside of the Wyckoff Starr. The vending machine, which evokes beloved, retired listings project Showpaper, offers up one newspaper-like poster (a discount code "coupon" for the album is printed below the lyrics) and one double-sided color poster (one side is their new album's cover art, and the other is identical to a Parquet Courts mural which has appeared across the street from the vending machine. Both items cost a mere 50 cents. The marketing stunt is in good company in North Brooklyn, where the Bikestock cycling supplies vending machine on Bogart St and Sunshine Laundromat's family planning vending machine in Greenpoint are popular neighborhood fixtures. Parquet Courts' new album, "Human Performance," is due out on Rough Trade Records on Friday, April 8th.